The traditional bean bag toss game is a perfect one for family picnics, weekends or holidays and it can take you from spring through to the fall! Autumn is definitely creeping into the air, and by looking at the calendar I can see that October is looming just ahead. Which gave me an idea for a building a great game for the fall. I want to suggest to you a project that the whole family can enjoy and be involved in building, one that is not only fun but is very popular during the football season. 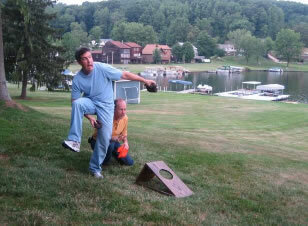 I’m sure that you have all seen or even played the game know by many names but I will call it Bean Bag Toss. 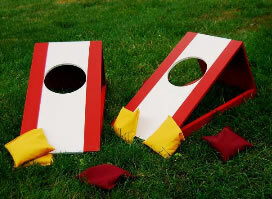 It is a simple game using bean bags that you toss onto an angled platform with a hole cut into it. 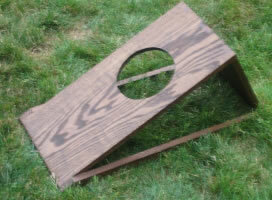 The object of the game is to toss the bean bag into the hole to score points. I know there are lots of versions that are available to purchase as well as build, but I would like to throw my bean bag into the ring so to speak. of this game of there own, but I was going to stick to Poppy’s. Just the fact that Poppy was born in 1894 in North Eastern Pennsylvania of English- Welsh decent lets me know that his version has at least been around for quite some time and that plenty of history to me. The game is constructed out of any type of lumber you desire, Jon choose to build his out of select pine since he knew he was going to stain and seal it. 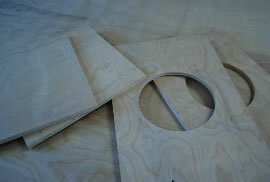 For our project I have decided to use ½ inch plywood, it can be painted and is easy to work with. 1. 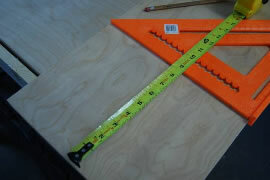 Using a circular saw, cut the ½ inch ply to a dimension of 48 inches in length by 12 inches wide, placing a 1” x 2” piece of pine for a guide will ensure nice straight cuts. 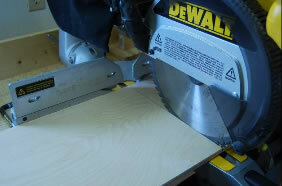 Make two passes using the circular saw to give you two top platforms and two support boards. 2. 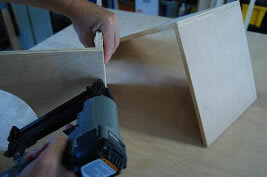 Cut the top platform and support board using a miter saw or circular saw to a length of 24 inches for the top platform board and 12.5 inches for the support boards. 3. You will have two boards of each length. Sand all the edges smooth with 120 grit sand paper. 4. 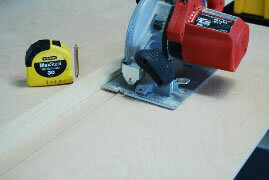 Working with the two top boards, measure down from the width edge 9 inches and find center of the board at this location by measuring in 6 inches from the side. 5. Draw a circle that measures 7 inches in diameter using a compass. 6. 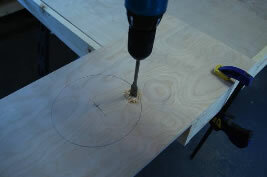 Cut out the circle by first drilling a small hole within the circle using a drill with a ½ spade bit or drill bit. 7. 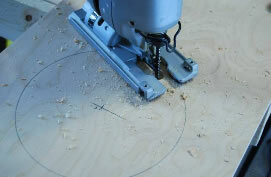 Then using a jig saw with a scroll blade, cut out the circle. 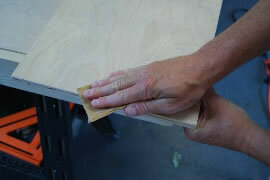 Sand the circle smooth using 120 grit sandpaper. 8. 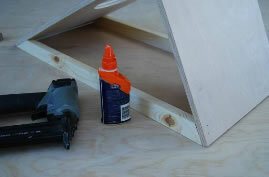 Now to assemble the boards, attach to the top platform using wood glue and finish nails. If you have a nail gun or compressor, this will be a snap. The boards will be at a 90 degree angle from each other, and the measurements of the support board give the top platform the perfect pitch. 9. Cut two 1” x 2” pine boards that will run from bottom of the support board to the bottom of the top platform to give the game stability and strength. 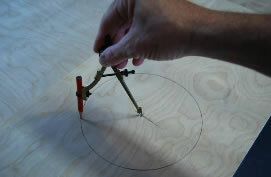 Attach from the top and side using wood glue and nails. 10. Sand all the edges smooth and stain, or paint the platform to the color of your choice. Finish up with a couple coats of polyurethane so that the game will last for years and years. 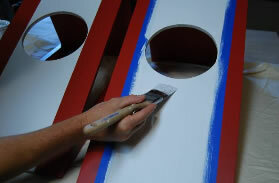 This is where the kids can have some fun, paint the boards their school colors or favorite sports team. For the bean bags, they should be about 6 inches square and should weigh about a pound. Each player will need 3 bags each and they should be a different color fabric. Sew the edges of the material wrong side out leaving a small hole to put in the beans (which can be dried corn or beans), turn the bag right side out, fill with beans and sew the opening shut. Of course, I did check the internet and there are many sites that you can order bean bags from, if you opt not to sew your own. As far as the game rules, since this game is a little smaller than the current modern versions, place the game about 20 feet apart. Each player takes a turn tossing one bag at a time standing behind or even with the game board. To score, you must go through the hole which scores one point. The kicker is, the last one to score gets all the points. So if I make two “holes in one” but Jon only gets one, but it is the last one in, Jon gets 3 points. I tell you, Jon and I spent about 3 hours playing this game the other night and we had a blast. A tip of the ole bean bag to Poppy! Hailing from the Reading area, we have had this version in my family for at least 3 generations. Thanks for sharing! We call the last bag the “hammer”. Minor difference: sides on our boxes. Otherwise: same. Maybe our measurements are slightly different.